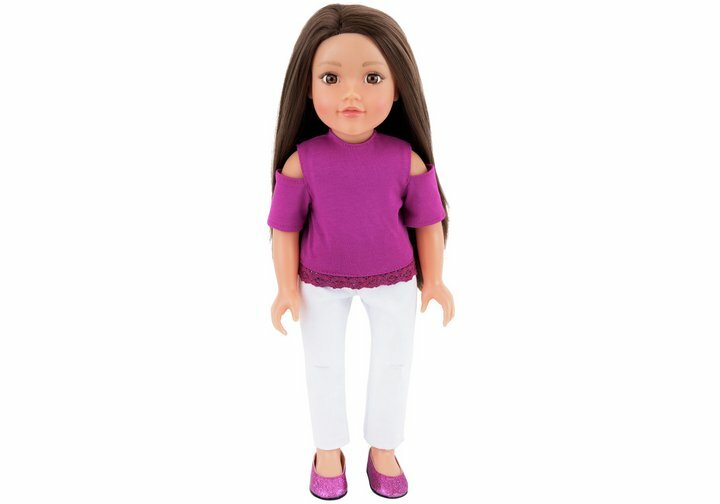 The Chad Valley Designafriend Abi Doll comes fitted out in a fetching purple 'cold shoulder' T-Shirt and stylish white distressed jeans, with purple suedette shoes to match the T-shirt and complete the ensemble. 'Hi I'm Abi and I adore the outdoors, my curiosity takes me on many fun adventures! If I'm not chilling out listening to my favourite songs you may find me enjoying glamping at a festival with my other DesignaFriends. We love to tell funny tales whilst we treat ourselves with hot chocolate and marshmallows, plenty of giggling going on! I'm not shy so it's not unusual to find me trying to tempt whoever closest to have a little dance or sing-song with me!'. Chad Valley Designafriend Abi Doll comes carefully gift packaged in a boutique style box with soft Designafriend tissue paper and contains a lovely silver heart pendant for a Designafriend doll charm bracelet, which is also included. Size H46cm. Get money off with April 2019 free Argos voucher codes, see if there's a discount code for the Chad Valley Designafriend Abi Doll product.